Charges against two Spokane men accused of attacking a transgender woman last winter have been dropped due to a lack of evidence, the Spokane County Prosecutor’s Office has confirmed. The charges stem from a confrontation that occurred in February at Boots Bakery & Lounge in downtown Spokane. According to court documents, Jacina Carla Scamahorn, a homeless transgender woman, spit in the face of Adam Flippen. Scamahorn, in court documents, said she spit in Flippen’s face after Flippen made disparaging remarks toward her on the patio outside of Zola. Flippen denies making the remarks. Flippen followed Scamahorn back into the bakery and assaulted her, according to court documents. 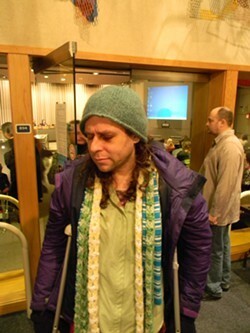 Marc Fessler is alleged to have made slurs during the incident. Flippen was charged with second-degree assault and malicious harassment, essentially Washington state’s hate crime statute. Fessler was also charged with malicious harassment. The incident triggered an outpouring of community outrage after news of the incident emerged, including a rally and a show of support for Scamahorn at a city council meeting. The charges were dismissed without prejudice, meaning that they can be refiled if the prosecution later finds more evidence. The prosecuting attorney on the case wasn’t available for comment.